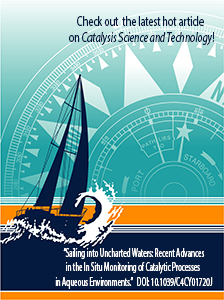 Scientists’ review of sailing into the uncharted waters of real time, in situ monitoring of catalytic conversions in water and other liquids was chosen as a hot paper. It is available for free until March 31, 2015. Results: Whether producing fuel cells or fertilizer, catalysts instigate reactions without being consumed. Despite their ubiquitous nature, solid catalysts in liquids are not completely characterized because scientific tools often struggle to analyze the reactions under realistic conditions in real time. However, new tools are providing insights. Three scientists from Pacific Northwest National Laboratory (PNNL) and Technische Universität München reviewed recent advances in Catalysis Science and Technology. The Royal Society of Chemistry selected the review as a "hot article." It is available at no cost until March 31, 2015. "The article highlights advances, but what it really does is show that for the complex phenomena being studied, no single technique can get the job done," said Dr. Xiao-Ying Yu, a review author who led the creation of an imaging tool that has garnered patents and a 2014 R&D 100 award. Why It Matters: Catalysts can be better. They can require less energy in the form of heat and pressure to drive the reaction. They can be more selective, using less feedstock to produce more products and less waste. To create better catalysts, scientists must determine how a solid catalyst behaves in water, which is known for its abundance, benignity, and unique solvent effects. The article showcases current techniques, including several designed for biological studies. The article also shares the authors' viewpoint on future directions in monitoring catalytic processes under real world conditions. "Catalysis and surface science chemists are arguably more familiar and comfortable with characterization toolsets to study gas/solid interfaces. With the rise of aqueous-phase heterogeneous catalysis and the pursuit of in situ characterizations, I believe it is time for explorations into uncharted territories," said Dr. Hui Shi, the paper's lead author. Shi is a postdoctoral fellow at PNNL's Institute for Integrated Catalysis. The Institute is led by Shi's mentor and the review's other author, Dr. Johannes Lercher. Methods: To interrogate such solid-liquid interfaces, scientists rely on techniques such as X-ray absorption spectroscopy that are not barred by use in water. For other techniques, water presents a problem. However, new tools are being developed as well as innovative techniques that allow tools previously incapable of working with water to do so. The authors focused on advances since the literature survey in Chemical Society Reviews in 2010. Throughout the review, the authors discuss the need for real-time investigations. Simply put, the steps of a catalytic process span from several minutes to a quadrillionth of a second. "So, obviously, it is attractive to develop capabilities within each tool for decoding each step on the respective time scale," said Shi. An area of special concern is developing mesoscale imaging techniques that allow scientists to study the macroscopic, or bulk, and microscopic, or atomic, worlds. "Making this connection means designing microreactors -- possibly scalable reactors -- that allow scientists to use different instruments to interrogate materials in different time and length scales," said Yu. What's Next: One of the advantages a multidisciplinary laboratory offers is the ability to bring together diverse teams for specific challenges. This team came together for this review. Now, each of them will continue on their own research. Sponsors: H.S. and J.A.L were supported by the U.S. Department of Energy, Office of Science, Office of Basic Energy Sciences, Division of Chemical Sciences, Geosciences, and Biosciences. X.Y.Y. was funded by two Laboratory Directed Research and Development efforts at PNNL: Materials Synthesis and Simulation across Scales Initiative (MS3) and the Chemical Imaging Initiative.